Learn about Needles, Basting, Threads, Pinning your quilt. We know many of you want to learn more about free motion stitching on your home machine. Learn tips so you can feel comfortable jumping in and trying it out on your own machine, plus features to consider when looking for a new machine conducive to free motion stitching! at Least 2 Quilt Sandwiches about 22x24 Muslin fabric is best, You will be able to make notes on your sample. Just stitch around the outer edge to hold it together. Sewing machine with free motion foot. Sew Slip Mat is highly recommended. 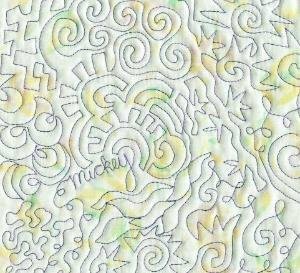 We do have panels for free motion quilting that you purchase to learn on. As always any supplies purchased at the BNQS for the class will get a 15% discount. Machine with free motion foot, Sew Slip Mat, Thread, 2 - 22"'x24" Quilt Sandwich.